For other uses, see Framing. An inertial frame of reference in classical physics and special relativity is a frame of reference in which a body with zero net force acting upon it is not accelerating; that is, such a body is at rest or it is moving at a constant speed in a straight line. In analytical terms, it is a frame of reference that describes time and space homogeneously, isotropically, and in a time-independent manner. Conceptually, the physics of a system in an inertial frame have no causes external to the system. An inertial frame of reference may also be called an inertial reference frame, inertial frame, Galilean reference frame, or inertial space. All inertial frames are in a state of constant, rectilinear motion with respect to one another; an accelerometer moving with any of them would detect zero acceleration. Measurements in one inertial frame can be converted to measurements in another by a simple transformation (the Galilean transformation in Newtonian physics and the Lorentz transformation in special relativity). In general relativity, in any region small enough for the curvature of spacetime and tidal forces to be negligible, one can find a set of inertial frames that approximately describe that region. In a non-inertial reference frame in classical physics and special relativity, the physics of a system vary depending on the acceleration of that frame with respect to an inertial frame, and the usual physical forces must be supplemented by fictitious forces. In contrast, systems in general relativity don't have external causes, because of the principle of geodesic motion. In classical physics, for example, a ball dropped towards the ground does not go exactly straight down because the Earth is rotating, which means the frame of reference of an observer on Earth is not inertial. The physics must account for the Coriolis effect—in this case thought of as a force—to predict the horizontal motion. Another example of such a fictitious force associated with rotating reference frames is the centrifugal effect, or centrifugal force. The motion of a body can only be described relative to something else—other bodies, observers, or a set of space-time coordinates. These are called frames of reference. If the coordinates are chosen badly, the laws of motion may be more complex than necessary. For example, suppose a free body that has no external forces acting on it is at rest at some instant. In many coordinate systems, it would begin to move at the next instant, even though there are no forces on it. However, a frame of reference can always be chosen in which it remains stationary. 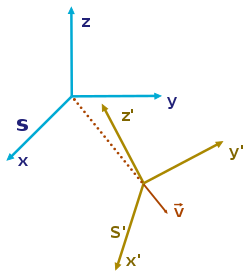 Similarly, if space is not described uniformly or time independently, a coordinate system could describe the simple flight of a free body in space as a complicated zig-zag in its coordinate system. Indeed, an intuitive summary of inertial frames can be given: in an inertial reference frame, the laws of mechanics take their simplest form. where the angular rotation of the frame is expressed by the vector Ω pointing in the direction of the axis of rotation, and with magnitude equal to the angular rate of rotation Ω, symbol × denotes the vector cross product, vector xB locates the body and vector vB is the velocity of the body according to a rotating observer (different from the velocity seen by the inertial observer). The extra terms in the force F′ are the "fictitious" forces for this frame, whose causes are external to the system in the frame. The first extra term is the Coriolis force, the second the centrifugal force, and the third the Euler force. These terms all have these properties: they vanish when Ω = 0; that is, they are zero for an inertial frame (which, of course, does not rotate); they take on a different magnitude and direction in every rotating frame, depending upon its particular value of Ω; they are ubiquitous in the rotating frame (affect every particle, regardless of circumstance); and they have no apparent source in identifiable physical sources, in particular, matter. Also, fictitious forces do not drop off with distance (unlike, for example, nuclear forces or electrical forces). For example, the centrifugal force that appears to emanate from the axis of rotation in a rotating frame increases with distance from the axis. All observers agree on the real forces, F; only non-inertial observers need fictitious forces. The laws of physics in the inertial frame are simpler because unnecessary forces are not present. In Newton's time the fixed stars were invoked as a reference frame, supposedly at rest relative to absolute space. In reference frames that were either at rest with respect to the fixed stars or in uniform translation relative to these stars, Newton's laws of motion were supposed to hold. In contrast, in frames accelerating with respect to the fixed stars, an important case being frames rotating relative to the fixed stars, the laws of motion did not hold in their simplest form, but had to be supplemented by the addition of fictitious forces, for example, the Coriolis force and the centrifugal force. Two experiments were devised by Newton to demonstrate how these forces could be discovered, thereby revealing to an observer that they were not in an inertial frame: the example of the tension in the cord linking two spheres rotating about their center of gravity, and the example of the curvature of the surface of water in a rotating bucket. In both cases, application of Newton's second law would not work for the rotating observer without invoking centrifugal and Coriolis forces to account for their observations (tension in the case of the spheres; parabolic water surface in the case of the rotating bucket). As we now know, the fixed stars are not fixed. Those that reside in the Milky Way turn with the galaxy, exhibiting proper motions. Those that are outside our galaxy (such as nebulae once mistaken to be stars) participate in their own motion as well, partly due to expansion of the universe, and partly due to peculiar velocities. The Andromeda galaxy is on collision course with the Milky Way at a speed of 117 km/s. The concept of inertial frames of reference is no longer tied to either the fixed stars or to absolute space. Rather, the identification of an inertial frame is based upon the simplicity of the laws of physics in the frame. In particular, the absence of fictitious forces is their identifying property. In practice, although not a requirement, using a frame of reference based upon the fixed stars as though it were an inertial frame of reference introduces very little discrepancy. For example, the centrifugal acceleration of the Earth because of its rotation about the Sun is about thirty million times greater than that of the Sun about the galactic center. To illustrate further, consider the question: "Does our Universe rotate?" To answer, we might attempt to explain the shape of the Milky Way galaxy using the laws of physics, although other observations might be more definitive, that is, provide larger discrepancies or less measurement uncertainty, like the anisotropy of the microwave background radiation or Big Bang nucleosynthesis. The flatness of the Milky Way depends on its rate of rotation in an inertial frame of reference. If we attribute its apparent rate of rotation entirely to rotation in an inertial frame, a different "flatness" is predicted than if we suppose part of this rotation actually is due to rotation of the universe and should not be included in the rotation of the galaxy itself. Based upon the laws of physics, a model is set up in which one parameter is the rate of rotation of the Universe. If the laws of physics agree more accurately with observations in a model with rotation than without it, we are inclined to select the best-fit value for rotation, subject to all other pertinent experimental observations. If no value of the rotation parameter is successful and theory is not within observational error, a modification of physical law is considered, for example, dark matter is invoked to explain the galactic rotation curve. So far, observations show any rotation of the universe is very slow, no faster than once every 60·1012 years (10−13 rad/yr), and debate persists over whether there is any rotation. However, if rotation were found, interpretation of observations in a frame tied to the universe would have to be corrected for the fictitious forces inherent in such rotation in classical physics and special relativity, or interpreted as the curvature of spacetime and the motion of matter along the geodesics in general relativity. This simplicity manifests in that inertial frames have self-contained physics without the need for external causes, while physics in non-inertial frames have external causes. The principle of simplicity can be used within Newtonian physics as well as in special relativity; see Nagel and also Blagojević. The laws of mechanics have the same form in all inertial frames. In practical terms, the equivalence of inertial reference frames means that scientists within a box moving uniformly cannot determine their absolute velocity by any experiment. Otherwise, the differences would set up an absolute standard reference frame. According to this definition, supplemented with the constancy of the speed of light, inertial frames of reference transform among themselves according to the Poincaré group of symmetry transformations, of which the Lorentz transformations are a subgroup. In Newtonian mechanics, which can be viewed as a limiting case of special relativity in which the speed of light is infinite, inertial frames of reference are related by the Galilean group of symmetries. Newton posited an absolute space considered well approximated by a frame of reference stationary relative to the fixed stars. An inertial frame was then one in uniform translation relative to absolute space. However, some scientists (called "relativists" by Mach), even at the time of Newton, felt that absolute space was a defect of the formulation, and should be replaced. A reference frame in which a mass point thrown from the same point in three different (non co-planar) directions follows rectilinear paths each time it is thrown, is called an inertial frame. A discussion of Lange's proposal can be found in Mach. The original question, "relative to what frame of reference do the laws of motion hold?" is revealed to be wrongly posed. For the laws of motion essentially determine a class of reference frames, and (in principle) a procedure for constructing them.
. Frame S' has an arbitrary but fixed rotation with respect to frame S. They are both inertial frames provided a body not subject to forces appears to move in a straight line. If that motion is seen in one frame, it will also appear that way in the other. Within the realm of Newtonian mechanics, an inertial frame of reference, or inertial reference frame, is one in which Newton's first law of motion is valid. However, the principle of special relativity generalizes the notion of inertial frame to include all physical laws, not simply Newton's first law. An inertial frame of reference is one in which the motion of a particle not subject to forces is in a straight line at constant speed. Hence, with respect to an inertial frame, an object or body accelerates only when a physical force is applied, and (following Newton's first law of motion), in the absence of a net force, a body at rest will remain at rest and a body in motion will continue to move uniformly—that is, in a straight line and at constant speed. Newtonian inertial frames transform among each other according to the Galilean group of symmetries. The weakness of the principle of inertia lies in this, that it involves an argument in a circle: a mass moves without acceleration if it is sufficiently far from other bodies; we know that it is sufficiently far from other bodies only by the fact that it moves without acceleration. There are several approaches to this issue. One approach is to argue that all real forces drop off with distance from their sources in a known manner, so we have only to be sure that a body is far enough away from all sources to ensure that no force is present. A possible issue with this approach is the historically long-lived view that the distant universe might affect matters (Mach's principle). Another approach is to identify all real sources for real forces and account for them. A possible issue with this approach is that we might miss something, or account inappropriately for their influence, perhaps, again, due to Mach's principle and an incomplete understanding of the universe. A third approach is to look at the way the forces transform when we shift reference frames. Fictitious forces, those that arise due to the acceleration of a frame, disappear in inertial frames, and have complicated rules of transformation in general cases. On the basis of universality of physical law and the request for frames where the laws are most simply expressed, inertial frames are distinguished by the absence of such fictitious forces. This principle differs from the special principle in two ways: first, it is restricted to mechanics, and second, it makes no mention of simplicity. It shares with the special principle the invariance of the form of the description among mutually translating reference frames. The role of fictitious forces in classifying reference frames is pursued further below. 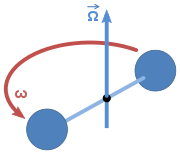 Figure 2: Two spheres tied with a string and rotating at an angular rate ω. Because of the rotation, the string tying the spheres together is under tension. Figure 3: Exploded view of rotating spheres in an inertial frame of reference showing the centripetal forces on the spheres provided by the tension in the tying string. Inertial and non-inertial reference frames can be distinguished by the absence or presence of fictitious forces, as explained shortly. The effect of this being in the noninertial frame is to require the observer to introduce a fictitious force into his calculations…. The equations of motion in a non-inertial system differ from the equations in an inertial system by additional terms called inertial forces. This allows us to detect experimentally the non-inertial nature of a system. Bodies in non-inertial reference frames are subject to so-called fictitious forces (pseudo-forces); that is, forces that result from the acceleration of the reference frame itself and not from any physical force acting on the body. Examples of fictitious forces are the centrifugal force and the Coriolis force in rotating reference frames. How then, are "fictitious" forces to be separated from "real" forces? It is hard to apply the Newtonian definition of an inertial frame without this separation. For example, consider a stationary object in an inertial frame. Being at rest, no net force is applied. But in a frame rotating about a fixed axis, the object appears to move in a circle, and is subject to centripetal force (which is made up of the Coriolis force and the centrifugal force). How can we decide that the rotating frame is a non-inertial frame? There are two approaches to this resolution: one approach is to look for the origin of the fictitious forces (the Coriolis force and the centrifugal force). We will find there are no sources for these forces, no associated force carriers, no originating bodies. A second approach is to look at a variety of frames of reference. For any inertial frame, the Coriolis force and the centrifugal force disappear, so application of the principle of special relativity would identify these frames where the forces disappear as sharing the same and the simplest physical laws, and hence rule that the rotating frame is not an inertial frame. Newton examined this problem himself using rotating spheres, as shown in Figure 2 and Figure 3. He pointed out that if the spheres are not rotating, the tension in the tying string is measured as zero in every frame of reference. If the spheres only appear to rotate (that is, we are watching stationary spheres from a rotating frame), the zero tension in the string is accounted for by observing that the centripetal force is supplied by the centrifugal and Coriolis forces in combination, so no tension is needed. If the spheres really are rotating, the tension observed is exactly the centripetal force required by the circular motion. Thus, measurement of the tension in the string identifies the inertial frame: it is the one where the tension in the string provides exactly the centripetal force demanded by the motion as it is observed in that frame, and not a different value. That is, the inertial frame is the one where the fictitious forces vanish. If bodies, any how moved among themselves, are urged in the direction of parallel lines by equal accelerative forces, they will continue to move among themselves, after the same manner as if they had been urged by no such forces. This principle generalizes the notion of an inertial frame. For example, an observer confined in a free-falling lift will assert that he himself is a valid inertial frame, even if he is accelerating under gravity, so long as he has no knowledge about anything outside the lift. So, strictly speaking, inertial frame is a relative concept. With this in mind, we can define inertial frames collectively as a set of frames which are stationary or moving at constant velocity with respect to each other, so that a single inertial frame is defined as an element of this set. For these ideas to apply, everything observed in the frame has to be subject to a base-line, common acceleration shared by the frame itself. That situation would apply, for example, to the elevator example, where all objects are subject to the same gravitational acceleration, and the elevator itself accelerates at the same rate. Inertial navigation systems used a cluster of gyroscopes and accelerometers to determine accelerations relative to inertial space. After a gyroscope is spun up in a particular orientation in inertial space, the law of conservation of angular momentum requires that it retain that orientation as long as no external forces are applied to it. :59 Three orthogonal gyroscopes establish an inertial reference frame, and the accelerators measure acceleration relative to that frame. The accelerations, along with a clock, can then be used to calculate the change in position. Thus, inertial navigation is a form of dead reckoning that requires no external input, and therefore cannot be jammed by any external or internal signal source. A gyrocompass, employed for navigation of seagoing vessels, finds the geometric north. It does so, not by sensing the Earth's magnetic field, but by using inertial space as its reference. The outer casing of the gyrocompass device is held in such a way that it remains aligned with the local plumb line. When the gyroscope wheel inside the gyrocompass device is spun up, the way the gyroscope wheel is suspended causes the gyroscope wheel to gradually align its spinning axis with the Earth's axis. Alignment with the Earth's axis is the only direction for which the gyroscope's spinning axis can be stationary with respect to the Earth and not be required to change direction with respect to inertial space. After being spun up, a gyrocompass can reach the direction of alignment with the Earth's axis in as little as a quarter of an hour. where r0 and t0 represent shifts in the origin of space and time, and v is the relative velocity of the two inertial reference frames. Under Galilean transformations, the time t2 − t1 between two events is the same for all reference frames and the distance between two simultaneous events (or, equivalently, the length of any object, |r2 − r1|) is also the same. Einstein's theory of special relativity, like Newtonian mechanics, postulates the equivalence of all inertial reference frames. However, because special relativity postulates that the speed of light in free space is invariant, the transformation between inertial frames is the Lorentz transformation, not the Galilean transformation which is used in Newtonian mechanics. The invariance of the speed of light leads to counter-intuitive phenomena, such as time dilation and length contraction, and the relativity of simultaneity, which have been extensively verified experimentally. The Lorentz transformation reduces to the Galilean transformation as the speed of light approaches infinity or as the relative velocity between frames approaches zero. There is no experiment observers can perform to distinguish whether an acceleration arises because of a gravitational force or because their reference frame is accelerating. —  Douglas C. Giancoli, Physics for Scientists and Engineers with Modern Physics, p. 155. This idea was introduced in Einstein's 1907 article "Principle of Relativity and Gravitation" and later developed in 1911. Support for this principle is found in the Eötvös experiment, which determines whether the ratio of inertial to gravitational mass is the same for all bodies, regardless of size or composition. To date no difference has been found to a few parts in 1011. For some discussion of the subtleties of the Eötvös experiment, such as the local mass distribution around the experimental site (including a quip about the mass of Eötvös himself), see Franklin. Einstein’s general theory modifies the distinction between nominally "inertial" and "noninertial" effects by replacing special relativity's "flat" Minkowski Space with a metric that produces non-zero curvature. In general relativity, the principle of inertia is replaced with the principle of geodesic motion, whereby objects move in a way dictated by the curvature of spacetime. As a consequence of this curvature, it is not a given in general relativity that inertial objects moving at a particular rate with respect to each other will continue to do so. This phenomenon of geodesic deviation means that inertial frames of reference do not exist globally as they do in Newtonian mechanics and special relativity. However, the general theory reduces to the special theory over sufficiently small regions of spacetime, where curvature effects become less important and the earlier inertial frame arguments can come back into play. Consequently, modern special relativity is now sometimes described as only a "local theory". "Local" can encompass, for example, the entire Milky Way galaxy: The astronomer Karl Schwarzschild observed the motion of pairs of stars orbiting each other. He found that the two orbits of the stars of such a system lie in a plane, and the perihelion of the orbits of the two stars remains pointing in the same direction with respect to the solar system. Schwarzschild pointed out that that was invariably seen: the direction of the angular momentum of all observed double star systems remains fixed with respect to the direction of the angular momentum of the Solar System. These observations allowed him to conclude that inertial frames inside the galaxy do not rotate with respect to one another, and that the space of the Milky Way is approximately Galilean or Minkowskian. ^ a b c Landau, L. D.; Lifshitz, E. M. (1960). Mechanics. Pergamon Press. pp. 4–6. ^ Albert Einstein (2001) [Reprint of edition of 1920 translated by RQ Lawson]. Relativity: The Special and General Theory (3rd ed.). Courier Dover Publications. p. 71. ISBN 0-486-41714-X. ^ Domenico Giulini (2005). Special Relativity. Oxford University Press. p. 19. ISBN 0-19-856746-4. ^ a b Milton A. Rothman (1989). Discovering the Natural Laws: The Experimental Basis of Physics. Courier Dover Publications. p. 23. ISBN 0-486-26178-6. ^ a b Sidney Borowitz; Lawrence A. Bornstein (1968). A Contemporary View of Elementary Physics. McGraw-Hill. p. 138. ASIN B000GQB02A. ^ Amedeo Balbi (2008). The Music of the Big Bang. Springer. p. 59. ISBN 3-540-78726-7. ^ Abraham Loeb; Mark J. Reid; Andreas Brunthaler; Heino Falcke (2005). "Constraints on the proper motion of the Andromeda galaxy based on the survival of its satellite M33" (PDF). The Astrophysical Journal. 633 (2): 894–898. arXiv:astro-ph/0506609. Bibcode:2005ApJ...633..894L. doi:10.1086/491644. ^ John J. Stachel (2002). Einstein from "B" to "Z". Springer. pp. 235–236. ISBN 0-8176-4143-2. ^ Peter Graneau; Neal Graneau (2006). In the Grip of the Distant Universe. World Scientific. p. 147. ISBN 981-256-754-2. ^ Henning Genz (2001). Nothingness. Da Capo Press. p. 275. ISBN 0-7382-0610-5. ^ J Garcio-Bellido (2005). "The Paradigm of Inflation". In J. M. T. Thompson (ed.). Advances in Astronomy. Imperial College Press. p. 32, §9. ISBN 1-86094-577-5. ^ Wlodzimierz Godlowski; Marek Szydlowski (2003). "Dark energy and global rotation of the Universe". General Relativity and Gravitation. 35 (12): 2171. arXiv:astro-ph/0303248. Bibcode:2003GReGr..35.2171G. doi:10.1023/A:1027301723533. ^ Ernest Nagel (1979). The Structure of Science. Hackett Publishing. p. 212. ISBN 0-915144-71-9. ^ Milutin Blagojević (2002). Gravitation and Gauge Symmetries. CRC Press. p. 4. ISBN 0-7503-0767-6. ^ Albert Einstein (1920). Relativity: The Special and General Theory. H. Holt and Company. p. 17. ^ Richard Phillips Feynman (1998). Six not-so-easy pieces: Einstein's relativity, symmetry, and space-time. Basic Books. p. 73. ISBN 0-201-32842-9. ^ Armin Wachter; Henning Hoeber (2006). Compendium of Theoretical Physics. Birkhäuser. p. 98. ISBN 0-387-25799-3. ^ a b Ernst Mach (1915). The Science of Mechanics. The Open Court Publishing Co. p. 38. ^ Lange, Ludwig (1885). "Über die wissenschaftliche Fassung des Galileischen Beharrungsgesetzes". Philosophische Studien. 2. ^ Julian B. Barbour (2001). The Discovery of Dynamics (Reprint of 1989 Absolute or Relative Motion? ed.). Oxford University Press. pp. 645–646. ISBN 0-19-513202-5. ^ L. Lange (1885) as quoted by Max von Laue in his book (1921) Die Relativitätstheorie, p. 34, and translated by Harald Iro (2002). A Modern Approach to Classical Mechanics. World Scientific. p. 169. ISBN 981-238-213-5. ^ Milutin Blagojević (2002). Gravitation and Gauge Symmetries. CRC Press. p. 5. ISBN 0-7503-0767-6. ^ NMJ Woodhouse (2003). Special relativity. London: Springer. p. 58. ISBN 1-85233-426-6. ^ Robert DiSalle (Summer 2002). "Space and Time: Inertial Frames". In Edward N. Zalta (ed.). The Stanford Encyclopedia of Philosophy. ^ C Møller (1976). The Theory of Relativity (Second ed.). Oxford UK: Oxford University Press. p. 1. ISBN 0-19-560539-X. OCLC 220221617. ^ The question of "moving uniformly relative to what?" was answered by Newton as "relative to absolute space". As a practical matter, "absolute space" was considered to be the fixed stars. For a discussion of the role of fixed stars, see Henning Genz (2001). Nothingness: The Science of Empty Space. Da Capo Press. p. 150. ISBN 0-7382-0610-5. ^ Robert Resnick; David Halliday; Kenneth S. Krane (2001). Physics (5th ed.). Wiley. Volume 1, Chapter 3. ISBN 0-471-32057-9. ^ RG Takwale (1980). Introduction to classical mechanics. New Delhi: Tata McGraw-Hill. p. 70. ISBN 0-07-096617-6. ^ NMJ Woodhouse (2003). Special relativity. London/Berlin: Springer. p. 6. ISBN 1-85233-426-6. ^ A Einstein (1950). The Meaning of Relativity. Princeton University Press. p. 58. ^ William Geraint Vaughan Rosser (1991). Introductory Special Relativity. CRC Press. p. 3. ISBN 0-85066-838-7. ^ Richard Phillips Feynman (1998). Six not-so-easy pieces: Einstein's relativity, symmetry, and space-time. Basic Books. p. 50. ISBN 0-201-32842-9. ^ However, in the Newtonian system the Galilean transformation connects these frames and in the special theory of relativity the Lorentz transformation connects them. The two transformations agree for speeds of translation much less than the speed of light. ^ For example, there is no body providing a gravitational or electrical attraction. ^ That is, the universality of the laws of physics requires the same tension to be seen by everybody. For example, it cannot happen that the string breaks under extreme tension in one frame of reference and remains intact in another frame of reference, just because we choose to look at the string from a different frame. ^ Chatfield, Averil B. (1997). Fundamentals of High Accuracy Inertial Navigation, Volume 174. AIAA. ISBN 9781600864278. ^ "The gyroscope pilots ships & planes". Life: 80–83. 15 March 1943. ^ LD Landau; LM Lifshitz (1975). The Classical Theory of Fields (4th Revised English ed.). Pergamon Press. pp. 273–274. ISBN 978-0-7506-2768-9. ^ David Morin (2008). Introduction to Classical Mechanics. Cambridge University Press. p. 649. ISBN 0-521-87622-2. ^ Douglas C. Giancoli (2007). Physics for Scientists and Engineers with Modern Physics. Pearson Prentice Hall. p. 155. ISBN 0-13-149508-9. ^ National Research Council (US) (1986). Physics Through the Nineteen Nineties: Overview. National Academies Press. p. 15. ISBN 0-309-03579-1. ^ Allan Franklin (2007). No Easy Answers: Science and the Pursuit of Knowledge. University of Pittsburgh Press. p. 66. ISBN 0-8229-5968-2. Poincaré, Henri (1900). "La théorie de Lorentz et le Principe de Réaction". Archives Neerlandaises. V: 253–78. Julian B. Barbour; Herbert Pfister (1998). Mach's Principle: From Newton's Bucket to Quantum Gravity. Birkhäuser. p. 445. ISBN 0-8176-3823-7. PJ Nahin (1999). Time Machines. Springer. p. 369; Footnote 12. ISBN 0-387-98571-9. Kurt Gödel An example of a new type of cosmological solutions of Einstein’s field equations of gravitation Rev. Mod. Phys., Vol. 21, p. 447, 1949. Animation clip on YouTube showing scenes as viewed from both an inertial frame and a rotating frame of reference, visualizing the Coriolis and centrifugal forces. "Is Gravity An Illusion?". PBS Space Time. 3 June 2015 – via YouTube.